Remember Spys4Darwin, Chris DeGarmo's first band after Queensryche? If you're like me, it has been a while. Check out the latest blog, which takes a look back on Spys4Darwin, and the supergroup's only recorded work -- the Microfish EP. A very happy 60th birthday to Geoff Tate! Spahr Schmitt, a fan from the western region of Pennsylvania, wrote in over the weekend confirming the venue for Queensryche's January 7, 1985 show at Mancini's Lounge in McKees Rocks, Pa., a suburb of Pittsburgh. He also sent in some photos of an in-store signing that took place the same day in Pittsburgh. Check it out at the link above. Thanks Spahr! This year marks the 35th anniversary of The Warning's release. While no special edition of the record seems imminent, my latest blog explains why one is so badly needed to finally return the mix and track sequence back to what the band and producer James Guthrie originally intended. Check it out! Happy New Year! I'm currently in the midst of a slight facelift project for AnybodyListening.net. I decided to make the main pages of the site a little cleaner, and remove the top banner. Check out the index page, main page, Prologue, and the Hear in the Now Frontier chapter for a taste of the new look. I'll be working on the rest of the pages over the next week, along with a new update of photos, stubs, scans, and more. I'm hoping for one final 2018 update that will contain new article scans, promotional item scans, old press materials, and a variety of other stuff. In the meantime, if you have any ticket stubs, pictures from shows, etc., that I don't already have displayed that you'd like to contribute, please drop me a line at artoflive156 AT yahoo dot com. I'd love to add them to the site. Geoff Tate is contributing to a 30th Anniversary edition of Empire! Check out the latest blog, where I discuss the news, and give a top-5 list of the contents we'd most like to see in the box! Can't you hear it calling? Friday Music has just released a 180-gram, double-LP, audiophile limited edition version of Empire, featuring a fresh remaster by Joe Reagoso. Hot off the press, here's our review of the new pressing! Thanks to Paul Guelpa, we now have a ticket stub and signed setlist from Queensrÿche's April 27, 1992, MTV Unplugged performance in Hollywood! In addition, Paul contributed stubs for a couple of other gigs - Dec. 7, 1988 opening for Metallica in Long Beach, Calif., and Dec. 14, 1991, Queensrÿche's own headline performance at Long Beach Arena. Another new blog added this time its a concert review: "Geoff Tate Celebrates 30 Years of Operation: Mindcrime in Sacramento." Give it a read, and check out some video I shot to see how the former Queensrÿche frontman is doing these days. Added a new blog today: "Top-10 Most Underrated Queensryche Songs (Original Lineup)." Check it out, and see if your favorite deep album track made the list! Acquired a stub from Queensryche's Jan. 15, 1985 headline gig in Washington, D.C. This confirms the venue as The Bayou at Georgetown -- info that had been missing previously. In addition, we now have passes from both the Nov. 20, 1990 and Feb. 19, 1995 shows, courtesy of Raf Ahrayeph! Thank you Raf. Other things added to the archive recently include some new band pictures from The Warning era, and a cover photo of Buurn from 1994, which features DeGarmo and Tate on the cover. This is listed in Promised Land era chapter of the site. Just a small update this week. A couple of new stubs. One from the April 29, 1991 gig in Wichita, Kansas; and another front/back stub from Queensrÿche's October 9, 1983 headline show in Reseda, California. In addition, I uploaded a new VIP pass for the July 12, 1997 gig in Tinley Park, Ill. Thanks to B. Davis, I added stubs for the April 20, 1991 headline gig in Dallas, Texas; and the Feb. 5, 1989 show opening for Metallica. Mr. Davis also provided some of his photos for the latter show. Much appreciated, B! In addition, I uploaded a UK promotional photo from the Promised Land era, a Mindcrime era BURRN Magazine cover, and a two-page EP era Japanese magazine advertisement. Uploaded a few things today. The first is a ticket stub to the Sep. 29, 1986 gig when Queensrÿche supported Ozzy Osbourne on the Rage for Order tour. I also added a couple of Operation: LIVECRIME promotional advertisements to the Empire chapter, and some new article scans from the The Warning, Rage for Order, and Operation: Mindcrime chapters. Just scroll down to the last scans, and those are the latest ones. Jan. 9, 1985 - Providence, R.I.
Jan. 10, 1985 - Portsmouth, N.H.
Jan. 15, 1985 - Washington, D.C. These dates were culled from the back of the t-shirt pictured below. Unfortunately, I don't have any venue (or setlist) information to add. Please let me know at artoflive156 AT yahoo dot com if you know the specific venues Queensrÿche played, or any other bits of information about or pictures from these shows. These were all headline dates before the band supported Iron Maiden for a run in New York City. Take hold! Discovered a potential new Rage for Order tour date last week -- April 24, 1987 at The Spectrum, in Philadelphia. Queensrÿche would have been an opener for headliners Deep Purple, and Bad Company was the direct support. Although I have added it to the archive, it is unconfirmed at the moment. 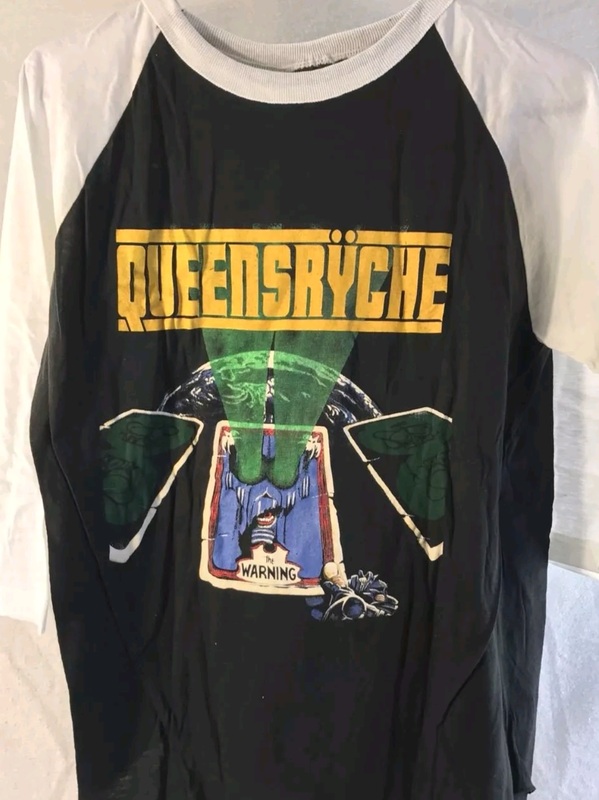 During this time frame, it is very likely Queensrÿche was in Philadelphia doing some pre-production work on what would become Operation: Mindcrime. 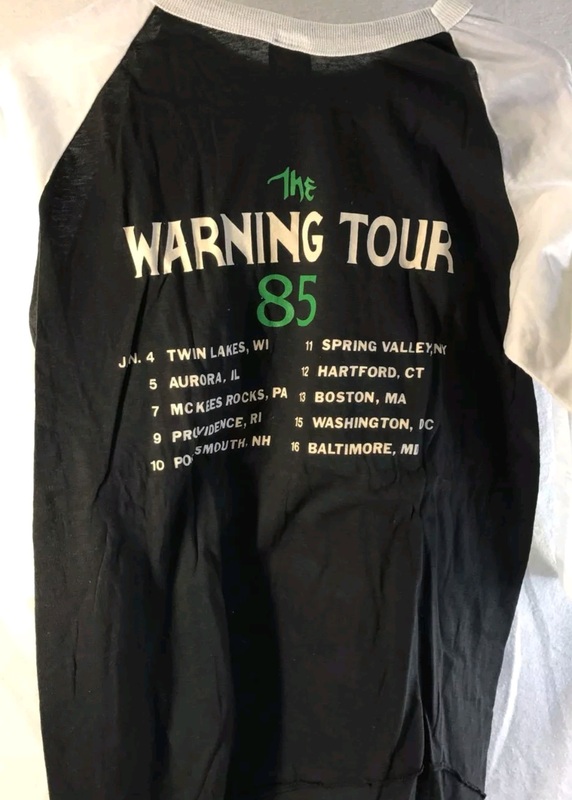 Seeing Queensrÿche's name appear in a couple different spots online as an opener at this show, and the fact they were in the area, and Chris DeGarmo had been booking a number of shows in 1986-1987 for them (QR was between management and booking agents at the time), I find it more likely than not the date is accurate. Until I can confirm it, however, I'll list the date as unconfirmed. If you were at that show, and can confirm Queensrÿche's appearance, and other details regarding the performance, please drop me a line at artoflive156 AT yahoo dot com. Thank you! It is pretty rare these days to find stuff from the EP Era of Queensryche. Thirty-five years ago is pretty damn old. But I stumbled upon a gig flyer/poster from the band's October 4, 1983 performance supporting Ronnie James Dio today, and added it to the site. Over the weekend I also adjusted the background imagery on each page/section of Queensryche's history. Each of the images is directly related to the era that the chapter covers. In addition, you may notice some lyric lines popping up randomly on each of those pages. I thought it would be a vague, but fitting way to focus on some of the lines from various Queensryche songs. Talk about finding buried treasure. I was looking for something completely unrelated and came across the Tribe era photo set of the band. But it wasn't just the photos of the original five guys together...it was all shots taken of the individual band members, including DeGarmo. Click the link above, and scroll down to view them! In addition, we have created a new Facebook page for AnybodyListening.net. I'll be doing my best to repost these updates there to help keep folks up-to-date on whatever we add to the site. 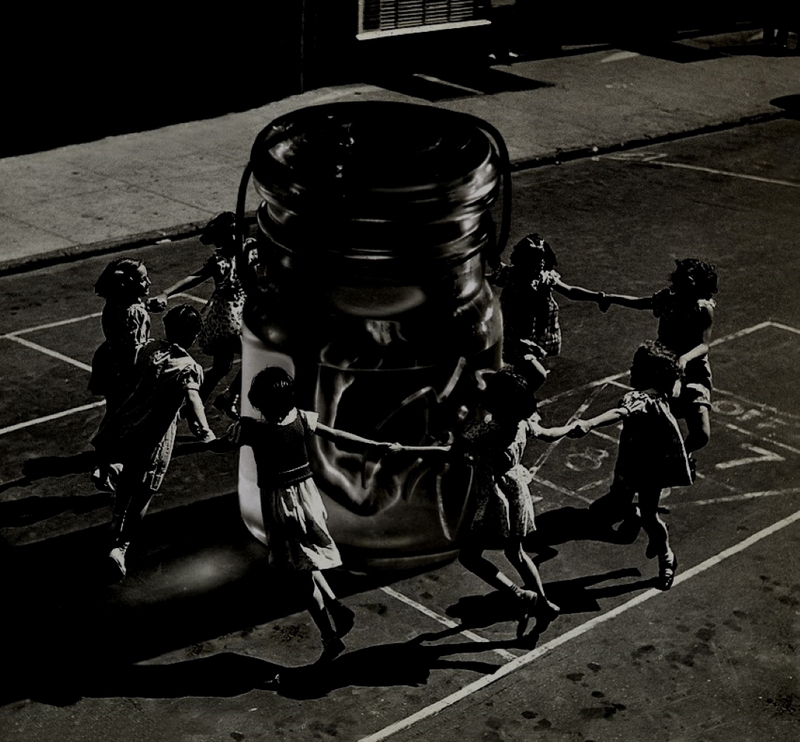 The Ides of March is once again upon us, and so too, is another update at AnybodyListening.net! Today we uploaded 16 different photos of the band from across the original lineup's career. Promotional shots, live images, and candids. Check out the "Band Photos" areas of each section for the latest additions (they'll be the last ones in the respective areas). Uploaded scans of a handful of trade advertisements for Empire, Operation: LIVEcrime, Building Empires, Promised Land, and Hear in the Now Frontier today. Check the respective chapters for the additions. Take Hold! Added some new and replacement scans of ticket stubs and posters from various gigs. They are as follows: Sept. 9, 1986; Apr. 25, 1991; May 25, 1991; Jul. 3, 1991; Jul. 31, 1991; Nov. 8, 1991; Mar. 20, 1995; May 19, 1995; and May 24, 1995. Uploaded a couple of Hear in the Now Frontier era promotional scans today. One for the album, another promoting the VLA/Secret Desert show on June 5, 1997, and a final one promoting "You," as the album's second single. All three scans were added to the Chapter VIII: 1996-1997: Hear in the Now Frontier Era section, under "Misc. Scans." In addition, I uploaded a ticket stub scan from the July 27, 1991 gig from Worcester, Mass., on the Building Empires tour. Check it out! A couple of friends recently asked that question so many Queensrÿche fans have asked for years: Why did Chris DeGarmo leave? My latest blog tackles the answer. Check it out! Today's update to the site is quite frankly a boring one. I went through most of the pages, tweaked the formatting (cleaned up some of the scrapbook tables, etc.) and overall layout. I know, riveting, right? My HTML skills are firmly rooted in the late 1990s, so I do the best I can. Hopefully, with a new Table of Contents page, this site looks more like an online book. For now, I think I'm happy with the overall look and layout, and will see what I can do to add more content to the site in the next couple of months. A few minor additions to the site today, including ticket stub scans for two Mindcrime-era gigs (5/5/89 and 10/2/88) and one show from the Empire tour (6/8/91). I also uploaded some Mindcrime-era magazine covers and reviews, and drum advertisements featuring Scott Rockenfield from both the Hear in the Now Frontier and Empire time periods. I have stripped down the older version of the site to something a bit more manageable. Most of the old content is still available, albeit in a modified structure. I eliminated a portion of the "Appendix" and incorporated all that material (discography, scrapbook, etc.) into each specific chapter (or era) of the band's history. There are several formatting fixes that still need to be done. The site has been offline for a bit, and during the change, there were a lot of minor things I didn't get to. Going forward, most of the updates now will be adding ticket stubs and scans of images and old articles that find their way into my inbox. I'll add to and freshen up the content as I have time. Thanks for stopping by!